Bookings for John of God tours need to be in and deposit paid for, at least one month before departure on the groups with your guide Anita. Try to book earlier as rooms fill fast now. Latecomers will always be considered, they can pay a deposit and settle the balance upon arrival. We like to try to keep places to approximately 10 to 12 persons ( We do not feel it is fair nor enjoyable, to host large and impersonal groups sometimes up 30 people or more ) so as to be able to ensure quality of service, warmly welcoming everyone. We will try to accommodate you even at short notice. Anita works also with 2 other partner guides whom host as guide when Anita cannot attend the particular date. They are very good guides and know the casa work inside out too. Please scroll down the page to "PRICES" to see costs for trip and deposit amounts per person, depending on length of stay, Thank-you. We Feel our prices are very fair when considering what some others charge, as well as considering the many hours of work with love we put in. Yet we genuinely feel we offer a high value service to groups and individuals joining us here with John of God. Having said that be aware of cheaper unauthorised imitators, whom have little or no experience and no deep understanding of the Casa spirit work. To us this is not just a service, it is a service with a lot of Love and compassion without taking away the professionalism that's required. The feedback we receive reflects this. We do NOT lead large and impersonal groups, as we cannot then offer such dedication and quality of service to your healing journey. We are also one of the smaller group of Guides whom are actually Official Guides of the casa, for many years, since 2003. Pounds sterling are subject to daily exchange rates. We will not be able to secure a booking without a deposit. Remaining payment to be paid within One month of departure date or as pre-arranged with Anita. Is also possible to be paid on day of arrival in certain instances (This needs to be paid in Dollars US Euros or in some instances Pounds UK) Deposit is non refundable, but can be shifted to another date Once within a 6 month period. We would need at least a months notice. Thank you. Please note: You will need to budget for taxi fares to and from the airport in Brazilia (we will always try help you to find a taxi share .The trip takes One and a half hours up to the healing village and costs 250 Brazilian Reas Approx 80 US . If you wish to visit the beautiful Temple of Goodwill Pyramid on the way back to the airport it will cost a little more, 100 reais . All organisation in Brazil as well as advice with booking flights ect. Accommodation ( We prefer to make sure you arrive directly to the Healing village on arrival in Brazil and so do not suggest touristic sightseeing in Brazilia nor staying over in Brazilia overnight before coming to the healing village, so as to immerse our visitors directly into the healing field at the Casa for maximum benefit and healing. We have experienced this to be most benefit to visitors healing process. Accommodation has ensuite shower and toilet facilities and has single, double or twin occupancy, with no single room supplement.A beautiful garden area for contemplation. The guest house is clean, safe, and very pleasant, friendly staff and has beautiful natural surroundings and garden, hammocks and balconies. 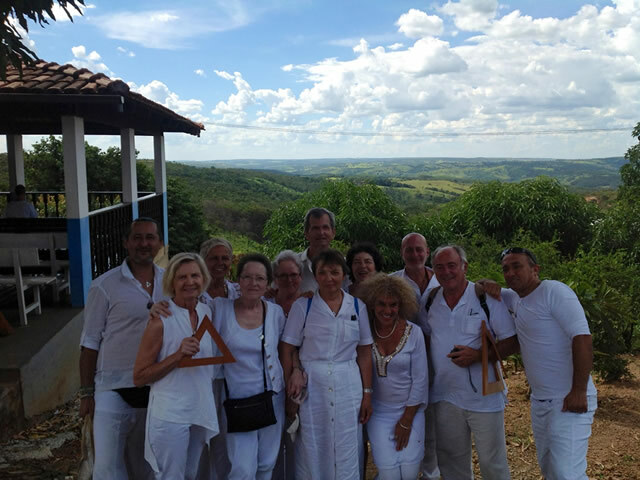 Our accommodation is only 5 minutes away from the John of Gods Casa De Dom Inacio healing center. So no need for taxis as from some guest houses. We do not use large guest houses that can be noisy with large groups, so as to maintain a quiet and supportive atmosphere for your healing and enjoyment. Accommodation includes Three wholesome tasty meals per day. Fresh fruits, a veritable abundance of salads and vegetables . Meals are buffet style and are veg and non veg. With tea coffee and juices. We take you through ALL casa procedures . No we do not leave you alone wondering what to do at crucial points in the process at the Casa. We are fully official long time endorsed Casa guides, whom have your best interests at heart. Help with translations every time you pass in front of John of God or in and around the Casa and sometimes at pousada or village of Abadiania. Help in the surgeries/spiritual interventions. Aftercare both in Casa De Dom Inacio and back at the guest house. Personal support in preparing requests and any questions for John of God. Support in going to visit the Sacred waterfall on site. Practical help and advice in and around the healing village of Abadiania and guest house. Especially important: Spiritual support and guidance on the Casa procedures and background of the spiritual work offered at the Casa de Dom Inacio, which will be essential for a deeper healing experience. Anita is known for being able to draw on her many years of experience and skills in hypnotherapy, counseling , group and individual work in physical, emotional and mental well being, as well as natural methods of healing, Bodywork, Re-birthing, Life coaching and Meditation...as well as her deep varied life experience. She offers her personal skills of over 30 years in the healing and spiritual growth fields, so that you may have the best chance possible to gain the most of your time here at the Casa. Anita is an endorsed medium and daughter of the Casa. We organise safe and reliable taxis to and from Brazilia airport in Brazil, with your name sign. We can include a short visit to Temple of Goodwill on the way back to Brazilia airport. We can also organize a city tour of interesting sites if you wish, in Brazilia on the day of departure for a small extra charge. An optional day out for a small extra charge, if appropriate depending on factors like where you are in your healing process . Guide to Casa to remind you of protocols. Our preferred method of payment is via pay pal ( see payment button on this site or deposit button on home page) or to be paid to pay pal address: anita@johnofgod-brazil.com Anyone needing to pay via bank, please speak to Anita re bank details. We always do our best to accommodate at short notice if at all possible , but is always best to secure your bookings as early as possible so as not to avoid disappointment. Places are limited places to maintain the best quality of attention for each person in fairness to each group participant. British Nationals and most Europeans do not need a visa , their passport will be stamped on arrival. To Visit Brazil some countries will need a visa from the Brazilian Consulate. If you are within the USA we recommend that you use "VISA EXPRESS" Forms can be filled out online, Fedex can pick up envelope if you wish. Allow approx. Two to Three weeks for this service, or for an added fee you can get it rushed through. You must have a round trip air ticket for Brazil, passport thats still valid for Six months, passport size photo, payment and a completed application form. You must apply for a tourist visa and not a medical visa. For a list of worldwide consulates please go to "Check list" page on this site and scroll down to the bottom of the page.